I knew very little of what to expect from Barcelona. I've heard such amazing things about it, but also a definite "watch your bags for the pick pockets". Barcelona is similar to Dublin in the sense that it doesn't really do high rises, but never have I seen a skyline with such varying structures. After one weekend there I finally understood why Gaudi was considered to be left of field, and I am now ever more grateful that not all of mankind has chosen to live as sheep. Using our stealth direction (OK maybe a map and turning down a few random streets) we found our hotel. The Acta Atrium Palace on Gran Via de la Catalanes is a 4 star boutique hotel, which surprisingly manages to fit in a small pool and a jacuzzi. There couldn't be any more than 60 rooms in this little gem of a hotel, and as well as being a perfect spot in Barcelona, the service is impeccable. On entering our room, we were presented with what can only be described as the best stocked room I've ever been in; a bathrobe and slippers for use when taking the lift to the pool, the biggest variety of toiletry essentials from a comb to a toothbrush, as well as soap and shampoo and two fluffy pillows each. After our obligatory swim, we were so hungry that eating was a must. We decided that a ramble down "La Ramblas" was also in order. Getting outside into the air made us even hungrier though, and we were running on empty, so much that practicality took over authenticity and our eyes lit up at the thought of a big fat juicy steak in the Hard Rock Cafe (inventive I know!). The Hard Rock Cafe is set i n Barcelona's main square Plaça Catalunya, and just around the corner from La Ramblas. On seating in the restaurant, we explained to our server that I was a celiac. She was extremely helpful and understood perfectly that it was important to eat gluten-free. She said the steak was fine, but with a salad instead of mash potatoes and fries as she explained the fries are done in the same fryer as the deep fried dishes. This can be fine for some celiacs, and not for others, so she said the salad was the safest thing. Also, no steak seasoning just in case. Out came this amazing steak, so juicy and tender, absolute perfection. With such a knowledgable and friendly staff with great English, this is a definite recommendation. Barcelona has two main sightseeing tour companies, both of whom operate two different bus routes in the city. We thought it best to take a bus tour as we're a) lazy and b) it took care of ou r travel. We chose to use the Bus Touristic, but I think it's much of a muchness between them. You can pay a hop on hop off price of €21 for one day or €27 for two days. We chose the two day option, which worked out so much cheaper, but it also meant we could do one route a day and get to explore the entire city. It meant we didn't have to deal with the metro and also gave us a bit of history along the way. Barcelona is like any European city in the sense that it has Gothic style architecture on many corners, but what makes it unique is definitely Gaudi. The buildings that Gaudi designed are truly unique and help give the city its unique sense of style. From the mid construction Sagrada da Familia Cathedral www.sagradafamilia.org (completely funded by donations) to Park Guell, you cannot but respect Gaudi's inventiveness, attention to detail, and sense of nature. You also have a versatile city in the sense that it has a long stretch of beach, but is also surrounded by hills. For lunch, there are a lot of choices in Barcelona, as it contains a wealth of places to eat tapas, but like every good celiac, you have to be careful. In general, lots of cafes and tapas bars will have beautifully cured meats, chorizo, tortilla espanol, melon with cured ham, fruit and salads. You can also take a stroll down La Ramblas, which is the main pedestrian thoroughfare in Barcelona. About half way you will find the "Mercat de San Josef de la Boqueira" (www.boqueira.info), a huge market that contains fresh produce as well as locally produced crafts. It's definitely worth a browse, especially if you feel like a picnic, but be aware that it is closed on Sundays. On a recommendation or two, we were told that the best place to have some seafood was down by the port. On further investigation, we also found that it's one of the best parts of town for bars, so we decided this would be our port of call (pardon the pun) on our last night. We came across many nice looking restaurants, all who promotion staff promisingly said that gluten-free was doable, but in the end we settled on Restaurant Miravent. The lady promoting the restaurant wasn't too pushy with us and had amazing English. After explaining I was a celiac, I was told my longing for some grilled Monkfish was not a problem. It came accompanied by seasonal vegetables which were all roasted together in a pot. She double checked with the chef and assured me that the vegetables were roasted in wine and oil, and no flour was added. Hurray! Boy were those vegetables comfort food. Add in a jug of Sangria and our meal was complete. To finish off our night, we wandered around the bars that surrounded our restaurant, took in the local atmosphere and went home full of lovely food. I was sad to leave Barcelona, but boy was it a nice trip! Definitely bring your celiac eating out card in Spanish, but the locals are more than happy to help you find something to eat, so smile and take in the atmosphere. The website currently only operates in Spanish, but here is the list of the restaurants in Barcelona that are linked to the society website. According to the society, these restaurants either have shown a good knowledge of celiac disease or the owner is a celiac. There are currently 21 restaurants on this list in the Barcelona area. Many of the restaurants listed have websites and contact details. As a precaution, you should always discuss your menu choices with your waiter before ordering. "Mercat de San Josef de la Boqueira"
Awesome! So nice to read about gluten free travel that went well. And it sounds like there were some delicious meals. I will be in Barcelona in February (from Canada) and your article really helps! Great trip! btw, the market is spelled “Boqueria” so the link is boqueria.info. Happy travels! Since you live in Dublin, I would love to see resources for GF accomodations and restaurants for Ireland. I want to plan a trip there but I am afraid to do the traveling so far from home. Can you provide that in your next blog? Hi Kelly – we love your blog! Have you had a chance to try the Bora Bora sample bars we sent you? We can’t wait to hear your feedback, thanks and have a great holiday! So glad to hear this! I will be living in a “subuer” of Barcelona- Manresa from January thru April. I am worried about my day-to-day living there as a Celiac. Ironically enough, I will be there to do gluten free baking formulation research & development. 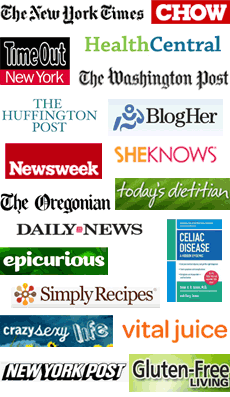 Thank you so much for your accounts & posting the Catalan Celiac web site. These guides are FANTASTIC! The worst part of being g-free is worrying about what you’ll eat when you travel. What a great idea! We are coming into NYC next weekend and would like some recommendations for GF restaurants. Not looking for pizza, but anything else would be great!!! I found your blog useful and fascinating. I have been to barca a few times but only once since I was diagnosed with Coeliacs. I know how difficult it is to travel and eat safely. I am English and travelled extensively through Europe and found it awkward to eat. I now own and run a restaurant in South Tenerife, I am promoting GF menu so that people can enjoy a night out safely. I will keep looking here for more useful travel tips. Thanks. Thank you for your post. We are leaving for barcelona in 3 days and I can’t wait to try some of the restaurants you recommended. Were you able to find gluten-free bread and breakfast pastries in Barcelona? I booked the same hotel. How were their gluten-free breakfast options? Thanks for sharing this GF info. Heading to Spain, Barcelona included, to celebrate an Anniversary, and always get a little anxious about being able to eat safely “..cuando necessito usar una otra idioma…” Your blog gave me confidence, allayed some fears, and with a spanish GF dining card, I know I will be fine! I love this blog. I am 17 and i just found out i have celiacs 6 months ago and its my dream to go to Spain. So I am definatly going to use this information! In Barcelona, in Diputacio street 55 (Eixample Izquierdo), we have just opened a new bar-restaurant called “Copasetic” and it offers many options for gluten & lactose intolerant people. The options include gf hamburgers, sandwiches, or even a gf crepe or pancake and many homemade cakes & sweets. I just discovered your blog. So helpful! My wife was diagnosed with celiac disease not too long ago and my daughter has a food allergy to milk and peanuts. Traveling is not the easiest thing to do. Last month we were in Barcelona and we discovered this website: https://www.allergychef.es/en where you can make online reservations to restaurants trained to cater people with food allergies and intolerances. We were able to try local cuisine without worrying about our dietary restrictions. At the restaurant, the chef knew we were coming and prepared a special menu for us. It was the best restaurant experience we ever had! I thought it would be interesting to share. Thank you again for your website! Rob!!! That is amazing…thank you so much for sharing! When I went to Barcelona, I decided to contact with the official Barcelona’s Hotel Association and ask for the best hotels for celiac people! They were very nice.